You know you’ve hit it big when you’re getting your own line of official dolls modelled after you. Yes, you’ve read it right: the boys of K-pop phenomenon BTS will soon be available in doll form in a newly announced collaboration with Barbie manufacturer Mattel. On 7 January, the toymaker shared on Twitter that they will be partnering up with BTS’ record label Big Hit Entertainment to introduce a series of dolls, collectible figures, games and more as part of the deal. The first range of dolls is set to be launched globally this summer and will be fashioned after the iconic looks from their ‘IDOL’ music video – think eye-popping ensembles in vibrant colours, flamboyant prints and quirky patterns. While ARMYs around the world were thrilled to hear the news, there are some fans who remain skeptical about the dolls’ appearance (well, the One Direction dolls were a bit of a hot mess if you ask us). Will they look like the Asian versions of Ken? Do they come with different sets of Gucci suits? Are they able to change hair colours with every comeback? So many questions! Not much details are revealed as of now, but Mattel did reassure fans via Twitter that they are not Barbie or Ken dolls, but “a new line of Mattel dolls”. Let’s just hope that Mattel does BTS justice with this one. Meanwhile, start saving up ARMYs! What are your thoughts on the BTS dolls? Yay or nay – tell us in the comments below! Before the likes of Cardi B and Drake took over our Spotify playlist, fellow 90s kids were jamming out to iconic singles from Backstreet Boys, Westlife and S Club 7 on our humble walkman player. Fast forward to now, we’re celebrating the 19th birthday of these throwback gems from the golden year of 2000. Let’s take a trip down memory lane and hit rewind on nostalgic tracks that turn 19 this in 2019. Before they became known as the artistes of the annoying album in your iTunes list, U2 had produced the infectious rock tune ‘Beautiful Day’ which won them a Grammy for best song of the year. Nothing can get more pop than ‘Bye Bye Bye’ from the boys of N’Sync. This song not only catapulted them to the top of the charts but also showcased their creative moves, which ultimately won them three awards at the 2000 MTV Video Music Awards including Best Choreography. If you’re not familiar with the 2000 film Coyote Ugly, then perhaps its unforgettable theme song might jog your memory. Since becoming a worldwide phenomenon back then, LeAnn had recently reimagined the pop ballad as part of her EP that was released in June last year. We’ve all had this song played at our graduation at least once. Combining the use of classical music and meaningful lyrics, this heart-tugging track never fails to remind us of our fondest school memories. With heartfelt lyrics inspired by his wife, frontman Rob Thomas didn’t have any intention to include this pop-rock number on their second studio album. But he’s probably glad that he did, as the positive reviews made it an instant chart-topper upon its release. As one of Linkin Park’s signature tracks and every angsty teenager’s go-to emo song, ‘In The End’ has received countless accolades which includes coming in second as Billboard’s most played rock song of the decade. We repeat, DECADE. Filled with empowering lyrics that easily made it one of the most critically acclaimed songs, this first single off her debut album undeniably cemented Nelly Furtado’s legacy in the music industry, with a Grammy for best female pop vocal performance to boot. Predicted by Bon Jovi himself to be a hit, this relatable rock anthem had been packaged with a touch of their signature 80s glam metal in an effort to introduce the band to a younger audience, while retaining their legion of already-loyal fans. Another boy band that had conquered the top of the pops in 2000, ‘My Love’ was Westlife’s second single off their second studio album that resurfaced recently as a cover by Korean-American singer Eric Nam on Immortal Songs 2. Officially chosen as the BBC Children in Need song in 2000, this pop ballad had not only peaked at the top of the UK Singles Chart but was also the ninth best-selling single in Britain in the same year. As one of the pop diva’s most iconic bops, ‘Oops!…I Did It Again’ consistently remained at the top of the charts and has since spawned numerous remixes, features and covers through the years. In spite of the controversial music video that was deemed gory, this award-winning dance-pop single was still a commercial success – making it Robbie’s third number-one hit since leaving his former band, Take That. Take that, critics! Released as the lead single off their fourth studio album, ‘Shape of My Heart’ went on to debut at number nine on the Billboard Hot 100 chart and broke the boys’ previous music video record on MTV’s TRL for longest running number-one song. Before the world remembered this song as the one William Hung infamously sung at American Idol, ‘She Bangs’ was the track that reaffirmed Ricky Martin’s success as a bilingual musician. Not only did the English version skyrocket to number one, his Spanish rendition also landed him a Latin Grammy Award! Described as musically and lyrically innovative, this empowering dance-pop track was lauded by critics for good reason. Oh, and did you know that the director for her music video back then is the same as the one Taylor Swift has worked with recently? Listed as NME’s 500 greatest songs of all time, this was probably the first song that garnered widespread attention as a diss track towards celebrities. Following its release in 2000, the popularity of ‘The Real Slim Shady’ has led to several covers and parody songs all over the world. Having landed her first movie role opposite Jet Li in Romeo Must Die, Aaliyah also lent her voice for the soundtrack in ‘Try Again’. Combining her sultry vocals and the futuristic beat, the smash hit went on to secure her legacy before her unfortunate fatal accident in 2001. Though it’s been identified as one of the most irksome songs with its repetitive lyrics, this familiar tune was still able to become a global sensation after appearing in Rugrats in Paris: The Movie. This melancholic-upbeat ballad was responsible for thrusting Coldplay into the spotlight since its release 19 years ago. Apart from consistently nabbing the number one spot on music charts, it has been covered by various artistes including a recent version in Mandarin for Crazy Rich Asians. How many of these songs can you remember? Tell us your favourite tracks in the comments below! Another year, another Coachella – but this year’s edition looks set to be the most exciting one yet. 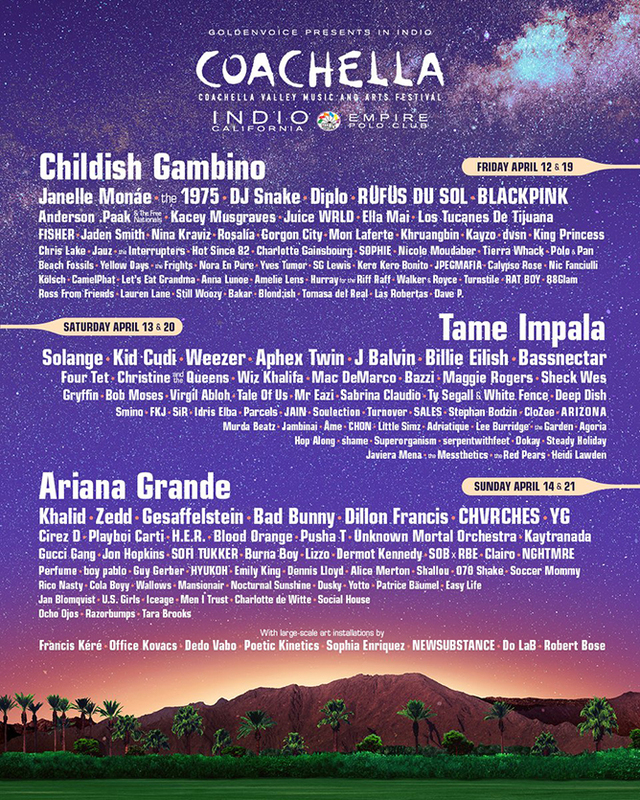 Held at the Empire Polo Club in Indio, California from 12 to 21 April 2019, the popular music fest features a stellar bill of up-and-coming artistes and must-see crowd favourites, such as Ariana Grande, BLACKPINK, Childish Gambino, Tame Impala, The 1975 and more. While the massive lineup of international acts is enough to send us packing, what really sealed the deal for us is the appearance of BLACKPINK. Known for their infectious earworms such as ‘DDU’DU DDU’DU’, ‘As If It’s Your Last’ and ‘BOOMBAYAH’, the YG four-piece will be the first ever K-pop girl group to perform at the annual extravaganza on 12 and 19 April. More impressively, it’s said that the founder of Coachella even flew over to Seoul to personally extend the invitation to the BLACKPINK girls! Also joining them on the Coachella stage is Korean indie outfit HYUKOH as well as avant-rock band Jambinai, who will be playing on 14 and 21 April, 13 and 20 April respectively. Other notable acts include Khalid, Zedd, Diplo and Solange, just to name a few. Which act are you most excited to see at Coachella? Let us know in the comments! 2018 was no doubt a stellar year in the world of Asian entertainment. Held at the Sands Theatre, Marina Bay Sands on 22 December, a star-studded lineup of artistes graced the stage at the inaugural StarHub Night Of Stars event, including Korean leading man Lee Joon Gi and Chinese actress Qin Lan of Yanxi Palace fame – who were the big winners of the night. The 36-year-old actor took home the Best Male Asian Star Award for his groundbreaking role as a gangster-turned-lawyer in Lawless Lawyer, which went on to become one of the highest rated series in Korean cable television history. What’s an Asian award ceremony without mentioning the biggest drama of 2018, Story of Yanxi Palace? Thanks to her brilliant performance as Fucha Rong Yin, the loveable actress not only won over the hearts of audiences worldwide, but also bagged the crown as Best Female Asian Star Award – truly a title fit for the empress. Taiwanese heartthrob Jasper Liu, who recently starred in the hugely popular film remake of More Than Blue, was also honoured with the Dazzling Star Award. A couple more awards were being handed out, but the moment that stole the show for us was when K-pop boy band A.C.E went up to receive the Best Newcomer Award. Despite making their debut more than a year ago, it was their first time attending an awards ceremony and being recognised for their hard work. Besides the award presentation, the audience was also treated to enthralling performances by A.C.E as well as Jeong Sewoon and Cosmic Girls, ending the night on a high note. What a magical night! Who do you think will make it onto the StarHub Night of Stars list this year? What better way to kickstart 2019 than some red-hot dating news in K-town? The newest power couple of the year is none other than two of the trendiest idols in the scene, EXO’s Kai and BLACKPINK’s Jennie! In news that shook the entertainment industry earlier this morning, Korean media outlet Dispatch (a domestic tabloid notorious for its annual tradition of exposing celebrity couples to the public every 1st Jan, the previous victims being BIGBANG’s G-Dragon and former After School member Jooyeon) revealed that the two stars have been dating in secret since October. According to the report, the pair was recently spotted holding hands on a date at a park in Seoul. In addition, Dispatch claims that Kai’s seemingly unassuming Instagram post on 25 November was actually a photo taken by his new bae, Jennie. okay if it’s true, damn kai. first, krystal. now, jennie. TASTE. What else can we say, dude sure knows how to get ’em girls. And in case you didn’t know, Kai and Krystal of f(x) were previously an item. They’ve split in 2017. For the uninitiated, Jennie just wrapped up promotions for her solo debut track ‘SOLO’. Looks like she ain’t a shining solo anymore! Gotta thank those Inkigayo sandwiches! Here’s the TL;DR: BIGBANG’s Seungri, who ironically happens to be Jennie’s fellow labelmate, dished that idols would sneakily scribble down their numbers on the plastic wrap of the famous sandwiches sold at the Inkigayo cafeteria, and pass it on to their crush. If Jennie not-so-coincidentally naming her puppy Kai isn’t enough to convince you that they are literally a match made in heaven, the BLACKPINK member also owns a teddy bear called Nini, which happens to be one of Kai’s nicknames given by fans. well they’re both kims, got the initials “KJ”, are called “nini”, jennie’s dog is named kai + they’re two years and two days apart. jongin was born in january 14 1994 while jennie was born in january 16 1996. But that’s not the only thing they have in common; this fan broke it down perfectly. Not to mention they’re both faces of luxury brands – Kai with his Gucci duds and Jennie, well, is basically a Human Chanel. Name a more powerful duo than #JenKai! all of us exo-ls who share one singular braincell: hold up, jongin can drive? And while most fans are busy showering the new couple with their best wishes, EXO-Ls are the ones asking the REAL question… Welp, guess this clears up the doubts! Once again, huge congratulations to Kai and Jennie!